Toyota’s new Concept-i car may look futuristic, but it has technology that’s even more cutting-edge that its looks. Yui is a system that reads the driver’s emotions in order to help with safe driving. Technology is part of our everyday lives. Sometimes, change happens so quickly we can barely keep up, but when it comes to vehicles, innovation takes time. Those flashy new features you see at trade shows are the result of years of development and testing. Ford now has Alexa. Alexa, Amazon’s cloud-base voice service, is now included in some Fords with SYNC 3. With the voice-activated system, you can check the weather, play audiobooks, add things to your shopping list, and even control smart devices back at home without having to turn your eyes away from the road. Chrysler has a concept minivan for millennials with families. The Portal is an all-electric vehicle that can go 250 miles per charge, and can be charged for another 150 miles in just 20 minutes. The minivan, which should hit the market sometime next year, has Level 3 autonomy, which means it can, in certain situations, drive itself (although a human driver must be prepared to take over at any time). The Portal also has facial recognition so it can identify the driver and set the temperature, music, and other essentials to that driver’s preference. Toyota unveiled an experimental car that will test some new technology. 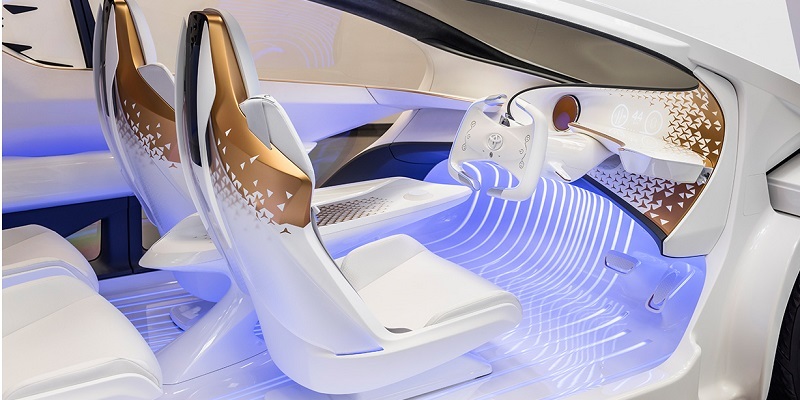 Toyota’s Concept-i car features technology called Yui that can read human emotions to help the driver when needed. For example, the technology can engage the driver, and if it senses the driver is tired, it will turn off the radio so the driver can focus on the road. Toyota officials say this unique, high-tech car is being designed primarily with safety in mind. Remember When Air Bags Were High-Tech? Technology is progressing at such a rapid pace that it’s hard to remember that not too many years ago, air bags were considered high-tech. But, car accidents are still claiming way too many lives. Research shows that every year in the United States, almost 100 people die in car accidents, and every day 12,000 are injured. Worldwide, more than 1 million people a year are killed. Developers hope that this innovation will help decrease those numbers. There are no automakers in Colorado, but the state is advancing a form of driving technology. The U.S. Commerce Department has chosen the Centennial State to test a new digital driver’s license. The two-year test program will allow some residents to have their license on a mobile app. If they need to show it, all they have to do is pull out their smartphone and go to the app. According to reports, the licenses will be secure, requiring a PIN or fingerprint for verification. If the phone is lost or stolen, the license can be deactivated remotely so no one else can use it. So, we are just one month into the new year, and already we’re starting to see new technology that may one day be used to make driving safer.